1. 40m 6a no bolts. An easy crack leads to a well featured wall. 2. 20m 6a 1 piton. A nice clean corner. Belay at a nice ledge at the center of pillar. 3. 40m 6a+ 6 bolts. One of the most beautiful pitches, where a thin crack leads to a bigger corner- crack. 4. 35m 6b+ 4 bolts and 2 pitons. Enjoyable wall climbing on good pockets leads to a very thin bold crack. Demanding finish from the left of the big block. 5. 35m 6a+ 3 bolts and 1 piton. Traverse 3m right on this ledge and climb the wall and ramp. Vegetated rock, besides the resent cleaning. 6. 15m 5a 2 bolts. Easy corner- ramp. It is possible to go directly to the next belay stance but it will be not possible to hear your partner. 7. 30m. Walking in the Jungle. 8. 30m 6a 2 bolts. Wall and big crack. Finish close to the Flag. Write your name, date and comments in the book. Left (yellow) variation: This is a partially bolted variation maybe from a party who does not know about the existence of the route. It is supposed that they started to climb from the bottom and they stopped when they found the old pitons and bolts of “Pillar”. 1. 40m 6a bolts? Two bolt belay stance at the ledge connected with a rope. 2. 20m 6b 5 bolts. A vertical wall climb. 3. 20m 6b 1 bolt. From the belay stance go right and up. Or direct up the corner- crack without bolts. Ext = Extension of the route. B = Belay. P = Pitch. pa = artificial move. Routes by: A. Theodoropoulos & D. Sotirakis at 8/4/1987. A classic multipitch climb, looking like a small copy of the famous “Nose”! Although there are some bolts at the belay stances and at the harder parts of the route, a full trad rack (nuts, friends and slings) it is required. 2 x 60m ropes is recommend. This route was the first one who opened on the big face above Leonidio in a 2 day push back in 1987. The locals stopped their works and watched the two climbers, as they cannot believe that their cliff could be climbed! After almost 30 years, the “Pillar” reequipped and cleaned at 4,5/1/2014 from Aris Theodoropoulos and Giannis Torelli. 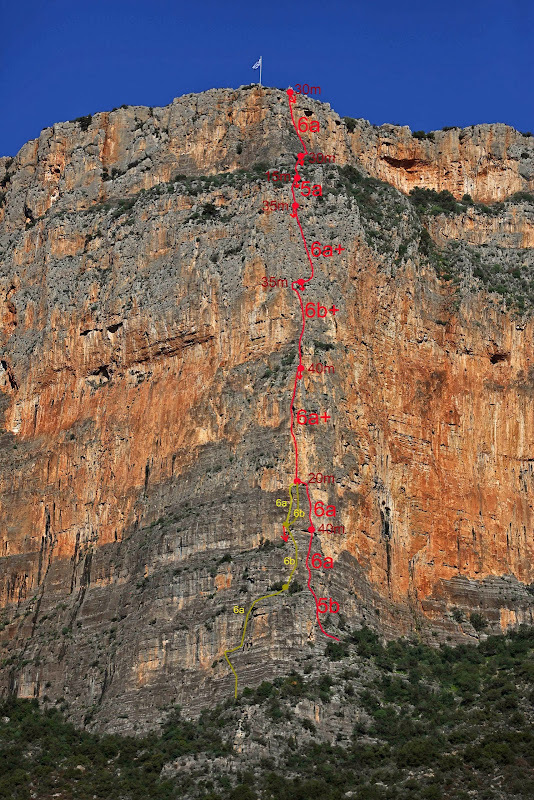 All the belay stances reequipped with 2 bolts (except the first one), and it is possible to abseil the route (6 rappels as seen in the topo). You can approach from above and park your car on the top. Follow the road to Vaskina and after about 5,5KM turn right on a dirt road (500m). Park your car next to the goat farm and walk SE for 15min to join the rappel point. (As seen in picture. To reach the rappel point you need to do some easy downclimb in a full vegetated ramp-ledge). Make a 55m rappel and walk in the “jungle” to join the path to “Ramisi”. No signs for the moment. Walking time: Walking and rapel and fight through the jungle for about 1 hour. The second solution is to join the base of the route from below. From Leonidio follow the road to Vaskina and at the first turn go right following a level dirt road. Leave the road at the level of “pillar of fire” and walk uphill following the red signs and cairns. Walking time: 20 min. To return: you could rappel down the route, but it is not recommended. If you cannot arrange someone with a car to pick you up from the top, walk to the right and look for the rappel point as the approach above.